Matte spray-on products work well for hunters looking for a dull, non-glossy finish that blends into the background. A bake-on polymer-type finish is a very good choice for a shotgun or rifle used in the winter or in damp environments (such as duck blinds). 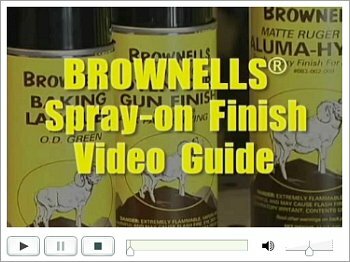 Brownells has created a Six-part series of videos that explain, step by step, how to apply a spray-on finish to gun parts. In Parts I & II, Brownells gunsmith Dave Bennetts explains the basics of spray-on finishes, then shows how to properly prep metal parts for finishing. Of the four featured products, Gun-Kote, sold by Brownells under license from KG Industries, offers superior corrosion resistance, and is probably the most popular of the four products for use on rifles. Gun-Kote was originally developed for the military and was first used by Navy SEALS. Gun-Kote is an “oven-cure” finish applied to pre-heated metal. Though it goes on thin, Gun Kote cures to a hard coating that resists abrasion and won’t wear through as easily as bluing or chemically blackened surface treatments. 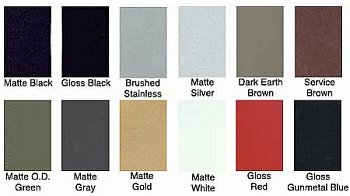 Brownells Gun-Kote is offered in a wide variety of colors, shown below. Share the post "Videos Show How to Apply Spray-On, Heat-Cured Gun Finishes"
Among the many good deals in Cabela’s Bargain Cave, we found a couple outstanding bargains this week. 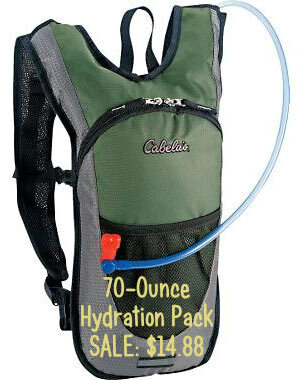 How about a quality hydration pack for $14.88, or a fleece neck gaitor for just $2.88? Note, Cabelas.com also currently offers free shipping on orders of $150.00 or more. Use Promo Code ’29SHIP’. The last time this Editor went to the range at the crack of dawn, it was about 30 degrees. 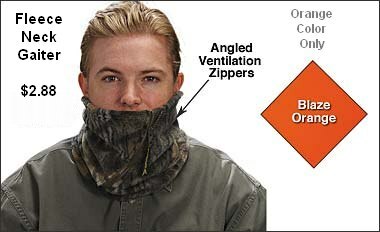 I sure could have used this warm, thick fleece neck gaiter. This Polartec “WAMUgaiter™” (item OG-942580) has an angled zipper so you can adjust ventilation. I’ve used these when skiing and riding a motorcycle as well. You can easily slide them up and down to adjust the warmth factor, and unlike a full-head-coverage Balaclava, they won’t make you look like a Ninja assassin. Note, the only color available is BLAZE ORANGE, though the photo below shows camo. That may disappoint some, but for under three bucks, how can you complain. This is a very versatile cold-weather item, on sale now for just $2.88. Share the post "Hot Deals from Cabela's Bargain Cave"